True white grubs are the larvae of May beetles (also called June Beetles) found in the genus Phyllophaga, of which there are over 100 different species. Phyllophaga larvae and other larvae of the family Scarabaeidae are often referred to as white grubs, including larvae of the Japanese beetle (Popillia japonica Newman), annual white grubs (Cyclocephala spp. ), and the green June beetle (Cotinis nitida Linnaeus). Figure 1. Adult Japanese beetle, Popillia japonica Newman. Photograph by James Castner, University of Florida. Figure 2. Adult green June beetle, Cotinis nitida Linnaeus. Photograph by John L. Capinera, University of Florida. Phyllophaga spp. and related insects are distributed throughout the United States and Canada. However, the distribution of individual species usually is more restricted. Adults: May beetles are about 12 to 25 mm long. Most adults are yellow to dark reddish-brown to black, robust, oblong, glossy beetles. Some, such as the green June beetle, are more brightly colored. Figure 3. Typical June beetle, adult of white grub, of the genus Phyllophaga. Photograph by James Castner, University of Florida. Larvae: The length of the larvae varies from 20 to 45 mm. Larvae are white with a C-shaped body, brown head, and three pairs of legs. The hind portion of the abdomen is slightly enlarged and appears darker due to the soil particles showing through the body wall. Two parallel rows of spines seen on the underside of the last abdominal segment distinguish true white grubs from similar-looking larvae. Figure 4. Typical white grub of the genus Phyllophaga. Photograph by John L. Capinera, University of Florida. Pupa: The length of the pupae varies from 20 to 24 mm long. The pupa is usually white, faint yellow, or dark brown in color. Eggs: Eggs are usually 1.5 to 3 mm in diameter and found encased in soil aggregates. They are small, spherical, pearly white eggs that darken just before hatching. The Phyllophaga life cycles vary somewhat because some species complete their growth in one year, while others require as much as four years. The common life cycle of the more destructive and abundant of these beetles extends over three years. The adults mate in the evening and, at dawn, females return to the ground to deposit 15 to 20 eggs, 1 to 8 inches deep in the soil. Since the adults are attracted to trees to feed, they tend to lay most eggs in the higher portions of sod near wooded areas. Eggs hatch about three weeks later into young larvae that feed upon roots and decaying vegetation throughout the summer and, in autumn, migrate downward (to a depth of up to 1.5 meters) and remain inactive until the following spring. The greatest amount of damage occurs as the larvae move near the soil surface to feed on the roots of the plants. The next autumn the larvae again migrate deep into the soil to overwinter, returning near the soil surface the following spring to feed on plant roots until they are fully grown in late spring. These grubs then form oval earthen cells and pupate. The adult beetles emerge from the pupal stage a few weeks later, but they do not leave the ground. The beetles overwinter in the soil, emerging the following year in May or June when feeding, mating, and egg-laying take place. Although white grubs can be a problem every year, the most serious damage occurs in regular three year cycles. The greatest damage to crops occurs the year after the appearance of the adults. During the years of heavy May beetle infestation, deep-rooted legumes, such as alfalfa or clovers, should be planted. If corn or small grains are present, every effort should be made to keep the field free of grass and weed growth to reduce the number of beetle eggs laid. The year following heavy flights of May beetles, planting corn or potatoes should be avoided in fields that were previously under sod or grass. Late spring or early autumn plowing destroys many larvae, pupae, and adults in the soil and also exposes the insects to predators, such as birds and skunks. For this cultural practice to be effective, plowing must occur before the grubs migrate below the plow depth. No-tillage or reduced tillage crop management encourages grub populations. Natural enemies that control these white grubs include parasitic wasps and flies in the genera Tiphia and Myzinum (Hymenoptera: Tiphiidae), and Pelecinus polyturator Drury (Hymenoptera: Pelecinidae), and the fly, Pyrgota undata (Diptera: Pyrgotidae). Also, Cordyceps fungus infects the grubs. Figure 5. Parasitic wasp larva feeding externally on white grub, Phyllophaga spp. Figure 6. A pelecinid wasp, a natural enemy of white grubs, Phyllophaga spp. Photograph by Paul M. Choate, University of Florida. Figure 7. A pyrgotid fly, a natural enemy of white grubs, Phyllophaga spp. Figure 8. White grub, Phyllophaga spp., infected with Cordyceps fungus. Photograph by Jim Kalisch, University of Nebraska-Lincoln. Inoculating the soil with bacterial spores of Bacillus popilliae Dutky and Bacillus lentimorbus Dutky aids in reducing populations. These products are available commercially. Davidson RH, Lyon WF. 1979. 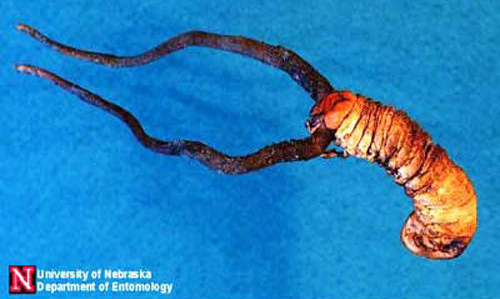 Insect Pests of Farm, Garden, and Orchard. John Wiley and Sons. New York. pp. 126-128. Jaques HE. 1951. How to Know the Beetles. WM. C. Brown Company. Dubuque, Iowa. pp. 241. Luginbill P Sr, Painter HR. 1953. Rev. Phyllophaga. U.S. Department of Agriculture Technical Bulletin 1060. 102 pp. Metcalf RL, Metcalf RA. 1993. Destructive and Useful Insects: Their Habits and Control. McGraw-Hill Book Company, Inc. New York. North Carolina Corn Information. (1998). White grubs. (no longer available online). Ritcher PO. 1966. White grubs and their allies: a study of North American scarabaeoid larvae. Oregon State Monograph Studies in Entomology 4: 1-219. Rolston LH, Barlow T. 1980. Insecticide control of a white grub, Phyllophaga ephilida Say, (Coleoptera: Scarabaeidae) on sweet potato. Journal of the Georgia Entomological Society 15: 445-449. Stehr FW. 1991. Immature Insects (Volume 2). Kendall/Hunt Publishing Co. Dubuque, Iowa. pp. 378-385. Tashiro H. 1973. Bionomics and control of root feeding insect pests: grubs and billbugs. Bulletin of the Entomological Society of America 19: 92-94. Woodruff RE, Beck BM. 1989.The Scarab Beetles of Florida (USA): (Coleoptera: Scarabaeidae) Part II. The May or June beetles (genus Phyllophaga). Arthropods of Florida and Neighboring Land Areas 13: 1-226. Publication Date: July 1998. Latest revision: April 2017.